For other uses, see Gun (disambiguation). A gun is a ranged weapon typically designed to pneumatically discharge projectiles that are solid (most guns) but can also be liquid (as in water guns/cannons and projected water disruptors) or even charged particles (as in a plasma gun) and may be free-flying (as with bullets and artillery shells) or tethered (as with Taser guns, spearguns and harpoon guns). The means of projectile propulsion vary according to designs, but are traditionally effected by a high gas pressure contained within a shooting tube (gun barrel), produced either through the rapid combustion of propellants (as with firearms), or by mechanical compression (as with air guns). The high-pressure gas is introduced behind the projectile, accelerating it down the length of the tube, imparting sufficient launch velocity to sustain its further travel towards the target once the propelling gas ceases acting upon it at the end of the tube. Alternatively, acceleration via electromagnetic field generation may be employed, in which case the shooting tube may be substituted by guide rails (as in railguns) or wrapped with magnetic coils (as in coilguns). The first devices identified as guns appeared in China from around CE 1000. By the 12th century, the technology was spreading through the rest of Asia, and into Europe by the 13th century. The origin of the English word gun is considered to derive from the name given to a particular historical weapon. Domina Gunilda was the name given to a remarkably large ballista, a mechanical bolt throwing weapon of enormous size, mounted at Windsor Castle during the 14th century. This name in turn may have derived from the Old Norse woman's proper name Gunnhildr which combines two Norse words referring to battle. In any case the term gonne or gunne was applied to early hand-held firearms by the late 14th or early 15th century. An early type of firearm (or portable gun) is the fire lance, a black-powder–filled tube attached to the end of a spear and used as a flamethrower; shrapnel was sometimes placed in the barrel so that it would fly out together with the flames. [full citation needed][full citation needed] The earliest depiction of a gunpowder weapon is the illustration of a fire-lance on a mid-10th century silk banner from Dunhuang. The De'an Shoucheng Lu, an account of the siege of De'an in 1132, records that Song forces used fire-lances against the Jurchens. In due course, the proportion of saltpeter in the propellant was increased to maximise its explosive power. [full citation needed] To better withstand that explosive power, the paper and bamboo of which fire-lance barrels were originally made came to be replaced by metal. And to take full advantage of that power, the shrapnel came to be replaced by projectiles whose size and shape filled the barrel more closely. [full citation needed] With this, we have the three basic features of the gun: a barrel made of metal, high-nitrate gunpowder, and a projectile which totally occludes the muzzle so that the powder charge exerts its full potential in propellant effect. Breech-loading guns called cetbang were used by the Majapahit Empire during the conquest of Nusantara in 1336–1350. The knowledge of making powder weapons in Java is thought to have originated from the Mongol invasion in 1293. These swivel guns mounted on various vessels of the Majapahit navy were used to great effect against traditional boarding-style warfare of other kingdoms in the archipelago. One theory of how gunpowder came to Europe is that it made its way along the Silk Road through the Middle East; another is that it was brought to Europe during the Mongol invasion in the first half of the 13th century. [full citation needed][full citation needed] English Privy Wardrobe accounts list "ribaldis", a type of cannon, in the 1340s, and siege guns were used by the English at Calais in 1346. The earliest surviving[clarification needed] firearm in Europe has been found from Otepää, Estonia and it dates to at least 1396. Around the late 14th century in Europe, smaller and portable hand-held cannons were developed, creating in effect the first smooth-bore personal firearm. In the late 15th century the Ottoman empire used firearms as part of its regular infantry. The first successful rapid-fire firearm is the Gatling Gun, invented by Richard Gatling and fielded by the Union forces during the American Civil War in the 1860s. The world's first sub-machine gun (a fully automatic firearm which fires pistol cartridges) able to be maneuvered by a single soldier is the MP18.1, invented by Theodor Bergmann. It was introduced into service in 1918 by the German Army during World War I as the primary weapon of the Stosstruppen (assault groups specialized in trench combat). The first assault rifle was introduced during World War II by the Germans, known as the StG44. It was the first firearm which bridges the gap between long range rifles, machine guns, and short range sub-machine guns. 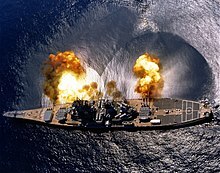 Since the mid-20th century guns that fire beams of energy rather than solid projectiles have been developed, and also guns that can be fired by means other than the use of gunpowder. Most guns use compressed gas confined by the barrel to propel the bullet up to high speed, though devices operating in other ways are sometimes called guns. In firearms the high-pressure gas is generated by combustion, usually of gunpowder. This principle is similar to that of internal combustion engines, except that the bullet leaves the barrel, while the piston transfers its motion to other parts and returns down the cylinder. As in an internal combustion engine, the combustion propagates by deflagration rather than by detonation, and the optimal gunpowder, like the optimal motor fuel, is resistant to detonation. This is because much of the energy generated in detonation is in the form of a shock wave, which can propagate from the gas to the solid structure and heat or damage the structure, rather than staying as heat to propel the piston or bullet. The shock wave at such high temperature and pressure is much faster than that of any bullet, and would leave the gun as sound either through the barrel or the bullet itself rather than contributing to the bullet's velocity. Barrel types include rifled—a series of spiraled grooves or angles within the barrel—when the projectile requires an induced spin to stabilize it, and smoothbore when the projectile is stabilized by other means or rifling is undesired or unnecessary. Typically, interior barrel diameter and the associated projectile size is a means to identify gun variations. Bore diameter is reported in several ways. The more conventional measure is reporting the interior diameter (bore) of the barrel in decimal fractions of the inch or in millimetres. 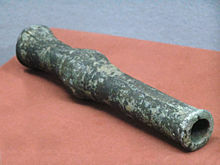 Some guns—such as shotguns—report the weapon's gauge (which is the number of shot pellets having the same diameter as the bore produced from one English pound (454g) of lead) or—as in some British ordnance—the weight of the weapon's usual projectile. A gun projectile may be a simple, single-piece item like a bullet, a casing containing a payload like a shotshell or explosive shell, or complex projectile like a sub-caliber projectile and sabot. The propellant may be air, an explosive solid, or an explosive liquid. Some variations like the Gyrojet and certain other types combine the projectile and propellant into a single item. The term gun may refer to any sort of projectile weapon from large cannons to small firearms including those that are usually hand-held (handgun). The word gun is also commonly used to describe objects which, while they are not themselves weapons, produce an effect or possess a form which is in some way evocative of a handgun or long gun. The use of the term "cannon" is interchangeable with "gun" as words borrowed from the French language during the early 15th century, from Old French canon, itself a borrowing from the Italian cannone, a "large tube" augmentative of Latin canna "reed or cane". Recent scholarship indicates that the term "gun" may have its origins in the Norse woman's name "Gunnildr" (which means "War-sword") (or "Gunnild", possibly Queen Gunhild of Wenden, wife of King Sweyn Forkbeard), which was often shortened to "Gunna". The earliest recorded use of the term "gonne" was in a Latin document circa 1339. 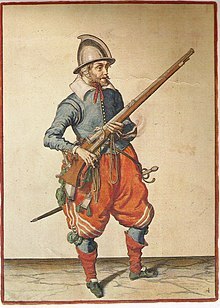 Other names for guns during this era were "schioppi" (Italian translation-"thunderers"), and "donrebusse" (Dutch translation-"thunder gun") which was incorporated into the English language as "blunderbuss". Artillerymen were often referred to as "gonners" and "artillers" Early guns and the men who used them were often associated with the devil and the gunner's craft was considered a black art, a point reinforced by the smell of sulfur on battlefields created from the firing of guns along with the muzzle blast and accompanying flash. The word cannon is retained in some cases for the actual gun tube but not the weapon system. The title gunner is applied to the member of the team charged with operating, aiming, and firing a gun. Autocannons are automatic guns designed primarily to fire shells and are mounted on a vehicle or other mount. Machine guns are similar, but usually designed to fire simple projectiles. In some calibers and some usages, these two definitions overlap. In contemporary military and naval parlance the term gun has a very specific meaning and refers solely to any large-calibre, direct-fire, high-velocity, flat-trajectory artillery piece employing an explosive-filled hollowed metal shell or solid bolt as its primary projectile. This later usage contrasts with large-calibre, high-angle, low-velocity, indirect-fire weapons such as howitzers, mortars, and grenade launchers which invariantly employ explosive-filled shells. In other military use, the term "gun" refers primarily to direct fire weapons that capitalize on their muzzle velocity for penetration or range. In modern parlance, these weapons are breech-loaded and built primarily for long range fire with a low or almost flat ballistic arc. A variation is the howitzer or gun-howitzer designed to offer the ability to fire both low or high-angle ballistic arcs. In this use, example guns include naval guns. A less strict application of the word is to identify one artillery weapon system or non-machine gun projectile armament on aircraft. A related military use of the word is in describing gun-type fission weapon. In this instance, the "gun" is part of a nuclear weapon and contains an explosively propelled sub-critical slug of fissile material within a barrel to be fired into a second sub-critical mass in order to initiate the fission reaction. Potentially confused with this usage are small nuclear devices capable of being fired by artillery or recoilless rifle. In civilian use, the captive bolt pistol is used in agriculture to humanely stun farm animals for slaughter. Shotguns are normally civilian weapons used primarily for hunting. These weapons are typically smooth bored and fire a shell containing small lead or steel balls. Variations use rifled barrels or fire other projectiles including solid lead slugs, a Taser XREP projectile capable of stunning a target, or other payloads. In military versions, these weapons are often used to burst door hinges or locks in addition to antipersonnel uses. ^ a b Judith Herbst (2005). The History of Weapons. Lerner Publications. p. 8. ISBN 978-0-8225-3805-9. ^ Buchanan 2006, p. 2 "With its ninth century AD origins in China, the knowledge of gunpowder emerged from the search by alchemists for the secrets of life, to filter through the channels of Middle Eastern culture, and take root in Europe with consequences that form the context of the studies in this volume." ^ Needham 1986, p. 7 "Without doubt it was in the previous century, around +850, that the early alchemical experiments on the constituents of gunpowder, with its self-contained oxygen, reached their climax in the appearance of the mixture itself." ^ Song Lian. History of Yuan. ^ Reid, Anthony (2012). Anthony Reid and the Study of the Southeast Asian Past. Institute of Southeast Asian Studies. ISBN 978-981-4311-96-0. ^ David Nicolle, Crécy 1346: Triumph of the longbow, Osprey Publishing; June 25, 2000; ISBN 978-1-85532-966-9. ^ "Ain Mäesalu: Otepää püss on maailma vanim". Archived from the original on 2012-06-14. ^ "Gun - Definition of Gun by Merriam-Webster". ^ "cannon - Origin and history of cannon by Online Etymology Dictionary". ^ a b Kelly 2004, p. 31. ^ Kelly 2004, p. 30. ^ Kelly 2004, p. 32. ^ "Captive Bolt Stunning Equipment and the Law - How it applies to you". Archived from the original on 2014-04-05. Buchanan, Brenda (2006). Gunpowder, explosives and the state : a technological history. Aldershot, England Burlington, VT: Ashgate. ISBN 978-1-351-93190-8. Kelly, Jack (2004). Gunpowder: Alchemy, Bombards, and Pyrotechnics: The History of the Explosive That Changed the World. New York: Basic Books. ISBN 978-0-7867-3900-4. Lee, R. Geoffrey (1981). Introduction to Battlefield Weapons Systems and Technology. Oxford: Brassey's Defence Publishers. ISBN 0080270433. Needham, Joseph (1986) . Science and civilisation in China. Cambridge England: University Press. ISBN 978-0-521-30358-3.